Ashtanga Yoga Worldwide is an outpost of the global Ashtanga Yoga community based in Fort Lauderdale, Florida. Ashtanga Yoga Worldwide maintains its focus on bringing this method of Yoga to Fort Lauderdale, helping foster yogic practices and ideals to serve the local community. We offer daily classes, intensives, and workshops at our Fort Lauderdale locale for Floridians to come learn with us, and for those global Ashtangis who want to refine their practice at a beautiful sub-tropical beach destination. 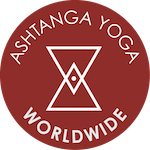 We cultivate our connections to the global Ashtanga collective by keeping a schedule of workshops at our network of yoga Shalas around the world. We support emerging communities and build strong relationships by returning over and over. Our logo is a bit of sacred geometry. The Bindu in the center represents the divine creation, in space and time. The triangles point up and down to represent the process of manifestation and transcendence. The circle represents the eternal unity that supports all of creation. It inspires each of us to focus on both our individual growth and our membership in a universal, collective.